For most people, the Reformation consists of a few facts. 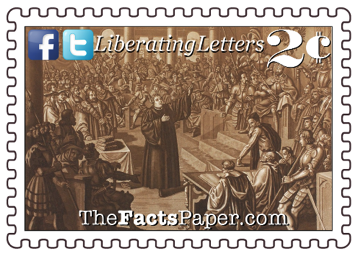 Martin Luther nailed 95 Theses, or discussion topics, to a church door on October 31, 1517. Because of it, he was excommunicated from the Catholic Church because he would not recant his theological writings. Others joined in the break from the Roman Catholic Church, resulting in the numerous Protestant denominations we know today. For most, this is the extent of their knowledge of the event. However, the Reformation was so much more than a shake up of the church. It was the turning point for the modern world, as we know it. When citizens went to Mass, they politely sat in their seats as the choir sang the hymns, and the priest chanted the liturgy in Latin. They then listened as the priest preached a sermon on what the Bible said, yet they had no way of verifying it. They were forced to accept what their priest, the Pope and the church claimed as they had no way to prove them wrong. In fact, Luther himself was never able to study a Bible until he arrived at the monastery. Still unsure of himself despite his ordination, others saw something in Luther that he himself didn’t see. He was chosen to go to Rome for monastery business, walking the 800 miles over the Alps, only to find a city that should have been a shining city on the hill as a modern day Gomorrah. He quickly realized the leaders and the priests in the church saw their position, not as a ministry, but as any other job. When he returned to Germany, he was appointed to teach at the University of Wittenberg. Even though Pope Leo X primarily dismissed Luther, other church and political leaders began to get nervous as Luther’s 95 theses spread like wildfire across the Holy Roman Empire, even reaching Spain within weeks of its printing. Thanks to Johannes Gutenberg’s printing press, of which Wittenberg just obtained one, as well as a time of peace for the Holy Roman Empire, the atmosphere was perfect for the spread of such controversial content. A very astute man, Luther quickly realized he could utilize the printing press to spread his message. However, at first, his goal was always to correct the errors of the church, not to break from it. Others in the past, such as Jan Hus, had professed similar criticisms of the church and indulgences, yet without a dominate medium such as the printing press, they were quickly disposed of in the manner of Joan of Arc. (see Joan The Maid) Luther assumed a similar fate for himself when the Pope summoned him to Rome in August of 1518 Possessing the same fear for Luther, Frederick the Wise, the ruler of Saxony, refused to allow Luther out of Germany. Frederick insisted they meet with Luther on German soil. Therefore, Cardinal Thomas Cajetan was sent to rebuke Luther’s teachings and insist he recant. However, Luther had discovered what the church had long forgot, allowing them to fall prey to the same issues Christ chastised the Jews for. They put authority in their own laws and declarations instead of recognizing authority came strictly from God and the Bible. Cajetan quoted papal proclamations to reprimand Luther, yet Luther refused to conform to any authority other than God’s Word. The meeting only confirmed to Luther that the Pope didn’t care that Tetzel was selling the unbiblical indulgences. Instead, he realized the Pope encouraged the practice as it was funding St. Peter’s Church in Rome, a fact which Luther soon began revealing in his writings and sermons. As the church tried to silence Luther, he continued to study the Bible and search for the answers he so desperately needed. While in Romans one night, he read in Chapter 1, “For in the gospel the righteousness of God is revealed--a righteousness that is by faith from first to last, just as it is written: ‘The righteous will live by faith.’” Up until this point, Luther viewed “righteousness” as the “wrath of God”. This verse revealed the true understanding of righteousness, justification by faith alone. This new understanding opened his eyes to what the church had been missing for so long - the Gospel. As he studied, he continued to write pamphlets for printers hungry for content to print. He was willing to oblige as he was anxious to share his revelations with the world. During the Reformation, Luther wrote 1/4 of all books in Europe, and is considered the first bestselling author. However, he received not one penny for his work. His only concern was spreading the truth, and he eagerly took advantage of the new technology to accomplish it. This is the path that Luther began through his honest and eager study of the Word. By breaking the chains of “works righteousness”, Luther revealed through scripture that we are truly free of the bonds of sin because of faith. He began to see righteousness was not something we earned, but a gift from God through Christ. However, as Paul later stated in Chapter 6, “You have been set free from sin and have become slaves to righteousness.” Meaning, with that freedom you can worry about your neighbor’s future since yours is secure. Without the shackles of the law, your life is to be lived in love, service, and compassion to others. Luther did not believe we were free to think and do whatever we wanted. He still recognized authority, the authority of the Word of God, for as Paul states to the Corinthians: “'I have the right to do anything,' you say--but not everything is beneficial. 'I have the right to do anything'--but not everything is constructive." (1 Corinthians 10:23) This new found freedom could have devastating effects for people’s souls if they did not model their behavior to that which God commanded. Hence, Luther took measures to encourage and support education for everyone, including women and children. In 1521, Luther was put in protective hiding at Wartburg Castle by Frederick the Wise where Luther used the time to translate the New Testament into German. At the time, though current day Germany was all under the Holy Roman Empire, it was divided into several smaller kingdoms where the people spoke different dialects of German. Luther took painstaking efforts to use common words and phrases so every citizen could easily read God’s Word. He finished his efforts in just eleven weeks. His German translation was so popular, its language became the template for the modern German language, uniting all the different German territories under one native tongue. Following a visit to several new reformed churches in 1528, Luther sadly realized some of the pastors didn't even know something as simple as the 10 Commandments. As a result, he published the Large Catechism, for leadership instruction, and the Small Catechism, for parents to use with their children. Designed specifically to teach, these two books were only second in importance to his Bible translation. In addition, Luther believed that the citizens should be participants in the worship service, not just mere observers. Therefore, Luther rewrote the mass in German using key verses for the liturgy and chants that the congregation would say as well as the pastor. He also comprised several hymns based on scripture for all to sing, full of doctrine devised to teach while glorifying God. While the majority of Luther’s writings specifically addressed God’s Word, he also commented on how Christians should then conduct themselves in everyday life. Luther was an avid proponent of a person’s right to think for themselves. He believed it was an inalienable right, just like he did free speech. He adamantly rejected the church and the government, who were one in the same at the time, from hindering the thoughts and ideas of people. It was only by the grace of God that Luther escaped the burning stake that took the lives of those before him who tried to stand up. Luther experienced firsthand the danger of the church and the state becoming one. He established that they should be separate, as they have different jobs. However, we don’t have to, nor should we be forced to choose which camp to be in. In fact, for a free society to actually work, the citizens must be members of both. With the printing press quickly becoming a formidable asset, Luther advocated that the media should keep a check on the government. In Luther’s day, one in four persons made a vow of celibacy because having a family was believed to be too difficult. However, the marriage of Luther and Katherine Von Bora, which produced six children, gave others a new perspective on the institution. It also opened Luther’s eyes to the wonderment of love for a spouse and a child. At a time when women were still seen but not heard, Katherine became the epitome of the modern woman. She ran the family finances as well as the farm, allowing Luther the freedom he needed to conduct his work. Luther grew to admire and love her so much, he included her in his will, which was illegal, giving her everything. Unfortunately, the crown destroyed the family property after Luther died, leaving Katherine with nothing. The church tried desperately to put the lid back on the box Luther opened, but it was a futile exercise. Lutherans continued to fight for their rights to believe their own doctrine, which didn’t happen until over nine years after Luther’s death. By that time, the idea of not just religious, but political, liberty and freedom had spoken to the people. Once ships became available to the New World, people craved to put into practice Luther’s ideas on not just religion, but his whole concept of freedom and how we should live our lives. This desire, whether they realized it came from Luther or not, brought the pilgrims to America in 1620. (see Thanks Be To God) However, Luther’s Preface quote given earlier came to life when the Massachusetts Bay Colony passed the Old Deluder Act of 1647, which required the education of children to ward off the “Old Deluder,” otherwise known as Satan. "It being one chief project of that old deluder, Satan, to keep men from the knowledge of the Scriptures,” the act required schools to teach the children to read the Bible. (see Eluding The Old Deluder) The law laid the groundwork of the American education system. Furthermore, Luther’s ideas laid the groundwork for a republic, with the government separate from the church, but never divorced from participants who are members of the church. In fact, he found it necessary. In Luther’s time, people craved the Bible yet its true contents had been purposely kept from them. Today, people openly and forcefully reject God’s Word, angry that it even exists. It has again been purposely and forcefully removed from school, courts and in some cases, churches, who value political correctness over Biblical truth. However, thanks to the 21st century “printing press”, those craving the Word are receiving it like never before through the internet and Bible apps. Liberty, Jesus told us we will be “hated by all nations” because of him. However, that does not mean we give up our mission of spreading the Gospel throughout the world. During your lifetime, you will find yourself having to choose between right and wrong. Between standing your ground or abandoning your principles. Find comfort and encouragement in Luther’s actions at the Diet of Worms. Even though he believed he would most likely be killed if he did not recant, he stood firmly on the Word of God. When God calls us, may we also find the strength in His Word to stand because we can do no other.